I remember a time long ago when I hated Sundays. I am sure this is because it is the day before Monday, and I spent the day dreading going to work. Somehow, I have completely forgotten to hate Sundays, and now its one of my favorite days. Here's why. I always sleep in. Usually until 9 AM. I love this. 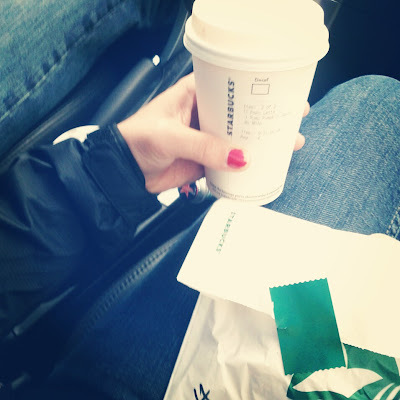 Its often a day that we don't have any more food in the house, so its a Starbucks breakfast day. The last two Sundays I have gotten a latte with 1 pump of pumpkin spice and a Ciabatta Ham sandwich. Yum! No, not healthy or Paleo, but still yummy. We usually go to the church meeting around 9:40, even though it starts at 9:30. The only stressful part is finding a parking spot. Once a month I teach the preschool kids meeting, which is super super fun. Sometimes I even convince Matt to help me out with that. Today I got to see some lovely friends and take photos of my favorite kid. We always tend to do our grocery shopping at Trader Joe's on Sundays. I LOVE Trader Joe's. I love going with Matty because he likes to be creative and buy exciting foods to make for dinner Sunday nights. Today I took photos of the pretty pumpkins. We bought some fresh flowers the past few Sundays, and that's something I would like to continue. Normally I have to do a long run on a Sunday afternoon, if I didn't get to it on Saturday. Since I love running, especially long runs, this is a huge highlight. Today I got to run in the sun!! I also got to run with a friend, which is always better than running alone. I ran to the U. Village area where I met up with Lindsay and we ran for about 6.5 miles on the Burke Gilman. This time of year, the trees are beautiful on this route! As I said before, Matty tends to cook on Sunday nights. Yesterday he made Pesto gnocchi and fried tilapia. He was trying to relive our experience in Italy. Last weekend, he made fresh wild caught salmon. Yum! The evenings are always pretty laid back and low key. Matty plays video games. I scrapbook. Or I watch a TV show. Or I read a book. Sometimes we have Pete and Hannah over. Its always relaxing and fun. Nothing like a week night. Now I just need to come up with some good reasons to love Mondays. I will be thinking about that. Hey Jenn, I'm glad you like Sundays now! I remember when you used to hate them :) Love your pics!